Copies may be ordered online. AABS financial members are eligible for a 25% discount. Brill has set up a promotion code for AABS members; please email the Secretary, Amelia Brown, at secretary@aabs.org.au to obtain the code. 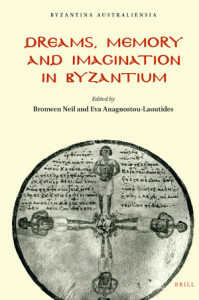 This collection of studies on Dreams, Memory and Imagination in Byzantium covers four main themes: the place of dreams, imagination and memory in the Byzantine philosophical tradition; the political uses of prophetic dreams and visions in imperial contexts; the appearance and manipulation of dreams and memory in Byzantine poetry and histories, and changing commemorations of the saints over time in art, epigraphy and literature. These studies reveal the distinctive and important roles of memory, imagination and dreams in the Byzantine court, the proto-Orthodox church and broader society from Constantinople to Syria and beyond. This volume of Byzantina Australiensia brings together the work of senior and early career scholars from Australia, Greece, Israel, Italy, Japan, New Zealand and the United States.